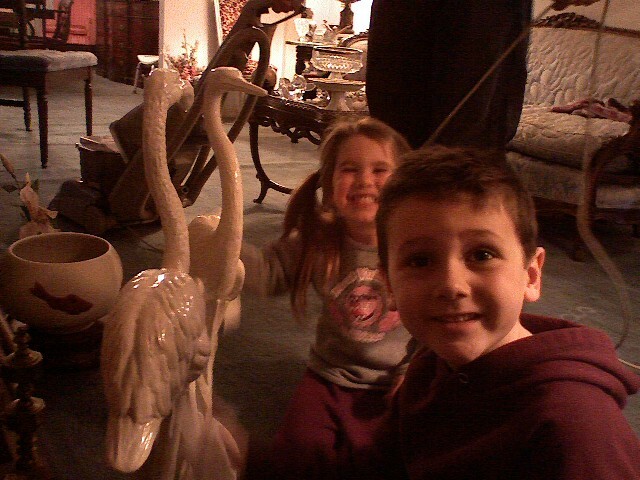 Yesterday, Matt, Gray, Maya (our niece) and I went down to Grandma's house to check on her and do some cleaning. We sat for a while, shared some donuts, had coffee, and got to chat, though sometimes it's kind of like chatting in the round- there's only about 4 questions we ever go through and we just cycle through them over and over, ala Groundhog's Day. But, she was in good spirits and that's all that matters. Yesterday she did remember the guy breaking into her house and talked about it briefly, though without emotion or excitement. Her caretaker Maria seemed surprised that she remembered. I got to look at the door, the jamb totally split. It's being temporary held together with some screws, but will be fixed entirely soon, complete with a new door. So we visited and cleaned- we cleaned all her carpets, did dishes, and cleaned pretty much anything that would stand still- here the kids are cleaning a pair of egrets that flank the fireplace. Well anyway, there's my report. I haven't heard what happened so far with the guy who broke in- I have a call in to find out about the arraignment, so hopefully I hear back soon. The best part of the day- I had envisioned have two small children in Grandma's chachke (sp?) laden home as difficult at best. To my surprise, I had forgotten the dynamic of the very old and very young, which is weird because I spend so much time riding with Father Time himself- you know who you are. Anyway, soon I'll post video of Grandma playing with the kids- they sat for a good hour at the table just talking and playing. She was so happy and both kids really loved being with her.